You know... I'm supposed to be making predictions at least sometimes in these posts. But I've been getting lost in the technical aspect of this book and the contradictions. Another chapter, another massive room. The door they entered through was easily seven humans tall. (Or as Wintermute puts it, "as large as seven humans standing feet on heads") Massive metallic columns are coming up from the center of the room connected to each other by strands of metal. Only "strands" in comparison to the size of the columns as the strands themselves are as thick as small rooms. These columns don't seem to have been part of the original design and rather seem like they've only grown recently, and continue to grow through and past the far wall. Venser speculates the columns are creating supports to create a new level, a new shell, all the way around the planet. But they question each other and bicker on what to do next, and eventually their guide confirms Venser's suggestion that they should travel within one of the strands. They can reach the core that way. They make their way into one, more bickering occurs that I won't subject you guys with, and they travel. What I didn't mention earlier was that in the room was a golden bubble that look older than these more recent columns, and the strand they picked would intersect with it. Once they reach that point, Koth heats up and melts the wall of the large tube they're in, and inside is a worn down room full of mostly broken monitors. It's part of the Panopticon of Memnarch himself. (Referred to as the Father of Machines by Koth.) The nerve center where the old ruler of Mirrodin watched over his world. The working panels show images on the surface and the endless waves of Phyrexians that cover it. Just then, three Phyrexians from within the chamber rush out from their hiding locations and rush the planeswalkers. They're easily dispatched. The after battle talk consists of Elspeth noticing that the Phyrexians (which have often been referred to has having small heads throughout the book, and at least these ones specifically as having small eyes) did not attack her until she moved. She can't be sure of ever seeing that behavior of with the previous Phyrexians they've fought, but Venser points out that she's almost always been the aggressor. Venser thinks to himself that he doesn't recall any Phyrexians on Dominaria ever doing that, but phyresis no doubt affected the inhabitants of this world differently. This conversation naturally leads back to studying the Phyrexians on the monitors and Elspeth asks why they Phyrexians can't seem to stand still. "Phyresis affects the nervous system. It fuses all the natural jumps of the body, making the creature very fast, but unable to fully turn off the pulses. When the stimulus comes, the body of a Phyrexian is unable to dissipate it. The charge causes movement, always." That sounds like good news to Koth, because it sounds like they're probably not good at sneaking. Venser counters by saying that Koth isn't necessarily right because he knows for a fact that Phyrexians have it in them to be quiet and that they can go into a catatonic state, a state which leaves them in a groggy state for a bit when they have to awaken. They discuss tactics some more, and Elspeth puts her two cents in about how well she knows the Phyrexians when their guide finally speaks up, saying that she obviously doesn't know the Phyrexians as well as she thinks she does if she only just figured out they can only see movement. They leave the Panopticon back the way they came, and walk and talk. Eventually they reach a new massive cavern and come up to a massive hole in the ground. A matching hole is in the ceiling. It's too far to see the bottom so Koth tosses a rock despite Elspeth's protests and rather than listening to hear it hit bottom, they see the rock slow down until it's speed is no greater than a leaf falling to the ground. Venser thinks this is a great idea. (Shortcut city!) They can just ump in, drift slowly, and make it to the core no problem. Smarter minds protest. We don't know how far this goes. We don't know if there are any exits once we do go in. (They don't know if the slow field is only temporary and they'll soon fall at regular or greater speeds. They don't know it's a garbage chute that leads to an incinerator. They don't know lots of things.) They can feel heat and mana, and that's all they know. "If we float down how do we know there are passages like this one branching off from the stem?" It was Elspeth who spoke. "We don't," Venser said. "But it would stand to reason that..."
"This is foolishness," Koth said. "I agree," said Elspeth. "We could fall forever." "This branch is here," Venser said. "We saw others branching off from the column. There must be other branches." "But we have no reason to believe that they are hollow," Koth said. Venser took off his helmet. "Have you ever read the Chronicles of Arrival? It has some good thoughts on the uncertainness of life. One of its revelations is this: 'No one has promised us a tomorrow.'" Koth pushed his chest out. "Are you accusing me of cravenness?" "Not at all," Venser said. "I'm accusing you of bad logic... and that's worse." Venser follows, but not last, since I must assume that their guide goes in with them as well as the so quiet and insignificant that she hasn't been mentioned at all for two chapters in a row, Melira. Don't listen to Venser. He doesn't know what he's talking about. Fusing all your nerves is crazy talk. It's not as if your body is slow to react in the first place the way it currently works, so I can't see how fusing them together would speed up the process to any practically noticeable speed. On top of that it seems to me that fusing them all together would eliminate any methods regulating which parts of the body should do what. There is a reason we have nerves in our body and not just one branched singular nerve. It would be as if every muscle is firing at once, much like if you were tazed. I don't want to go pick up my Cell Biology or Anatomy books and go deeper into it, but Venser is talking crazy talk and just pretending to be smart. 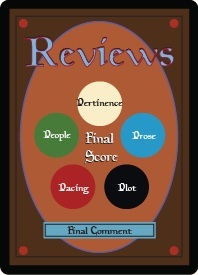 The pompus Venser stands straighter for a better angle to stare down his nose at Koth and he bobs his head from side to side as he says, "Haven't you ever read the Chronicles of Arrival? It's only the most popular of books read by only the most popular of people. Certainly even you Mirrans have laid yours hands on it. The book's popularity has naturally led to it being produced on many a plane. You can't honestly be telling me you haven't read it. That's ridiculous." Koth was too slow to respond, so Venser eyed him up and down, turns up his nose at the caveman of a planeswalker, and instead rests his eyes upon the beautiful white warrior who is undoubtedly more cultured than that simpleton and can undoubtedly understand the obviously more talented and handsome Venser's plight. Bad logic is worse than being a coward? It might be. And Veser is without question on the bad end of that statement. I have not taken a class in logic, but with a quick google search of the fallacies of logic, Venser seems to be exhibiting a fallacy of composition . In my more laymen's terms, he's simply generalizing the current conditions of the hole and believing it has to still be true further in. But unless the hole is infinite in length, at one point there is going to be a last exit branching off the tube, and he has no way of knowing if they're in that last exit right now. We're in Chapter 14 of 22. I'm going to force myself and consider the wider picture right now. Q: Will our heroes find Karn? A: Yes. 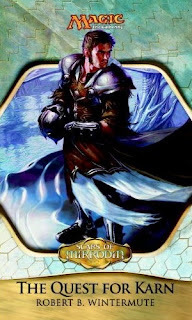 Not only is this the Quest for Karn, but the day before the book's release A Savor the Flavor article was published the revealed the Karn Liberated card. Like I said before , knowing that exists gives away the ending of the book. 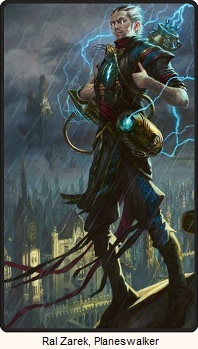 Q: Will Koth be redeemed and Elspeth find closure? A: Maybe and Probably. With the set being confirmed as New Phyrexia, they probably don't cleanse Mirrodin of Phyrexians, but I do believe that Koth will become accepted by his people. 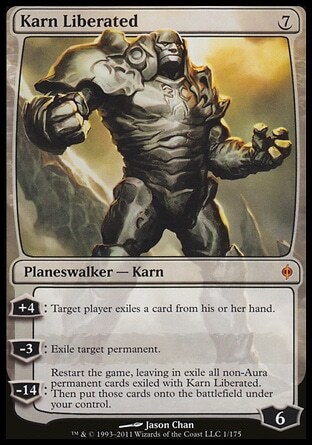 Elspeth will certainly feel some sense of accomplishment when Karn is freed. Q: What will happen with Venser's drug habit? A: I don't know. It's hard to say since this is my first exposure to the new planeswalkers post-Time Spiral block. He's running out of drugs. He may very well need to take the last bit of it for one final miracle save. Melira does have healing powers which she hasn't used on him yet. That may cure his sickness. Q: What will happen to our villains? A: Tezzeret will have accomplished his mission in disrupting things for both sides, and continue working for Nicol Bolas. Glissa will... maybe... take over as leader of New Phyrexia. Based off just the book I would say this is the case. Geth will die a useless pathetic death, and we'll never see any of the other praetors. Q: How will Karn save the day like Venser thinks he will? A: I couldn't possibly tell you. Wintermute's logic has made little sense so far, so predicting how the book will be resolved is pretty much next to impossible. The only thing I can say, like I said above, that the saving of the day will probably be more personal, rather than planet wide, with a oath to comeback eventually and reclaim his planet.